The outlandish rhetoric of Republican presidential wildcard Donald Trump has left many journalists at a loss for words—words such as bigotry, xenophobia, racism, sexism and demagoguery. Some media outlets raised these issues. Yet many reporters (or perhaps their editors) still seem reluctant to move past the aphasic and simplistic sports-reporting model, in which ideological content analysis is renounced. An example of a typical article is the piece on Trump’s stump speech by Michael Finnegan and Kurtis Lee in the Los Angeles Times (9/15/15). It is well-written, colorful and even includes the obligatory single sentence from an anti-Trump protester. Yet there is little serious political or historic context. One line does note that Trump borrowed from “Richard Nixon’s polarizing pledge to stand up for the ‘silent majority’ amid the social upheaval of the 1960s.” Nixon’s speech, however, concerned support for the Vietnam War. A more apt comparison would have been Nixon’s “Southern Strategy” to garner votes from white voters (The Nation, 11/13/12). Journalists and scholars familiar with the rise of contemporary right-wing populist political parties and social movements in Europe, however, recognize that xenophobic, anti-immigrant and racist rhetoric can lead to acts of violence. The leaders of organized political or social movements sometimes tell their followers that a specific group of “Others” is plotting to destroy civilized society. History tells us that if this message is repeated vividly enough, loudly enough, often enough, and long enough—it is only a matter of time before the bodies from the named scapegoated groups start to turn up. Freedom of speech is not the issue. A free and open debate is a necessity for democracy. Trump therefore is not legally culpable for any acts of violence against his named scapegoats. Trump should be held accountable on a moral basis by the media for his using the tools of fear, such as demonization and scapegoating, that put real people at risk for attacks. 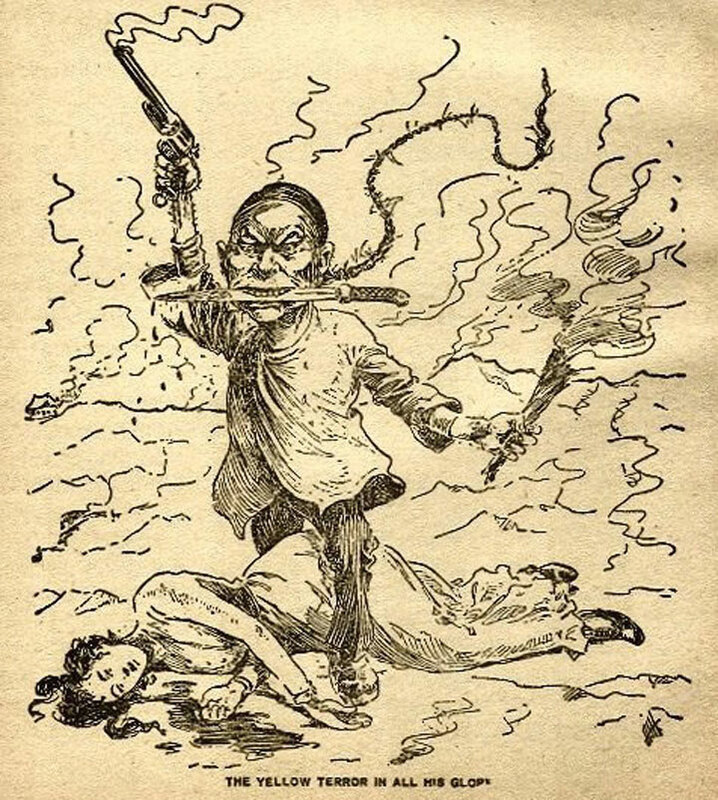 Many instances of physical attacks are chronicled in Hing’s article, although motivation is usually unclear. One pair of attackers did tell police they were directly influenced by Trump’s rhetoric, according to the Associated Press (9/3/15). Trump said he does not condone violence. Nonetheless, immigrant rights activists worry violence will increase. What Trump is doing, via the media circus of which he has appointed himself ringmaster, is making the articulation of the basest bigotry acceptable in mainstream outlets, amplifying the many oppressive tropes and stereotypes of race and gender that already exist in more than adequate abundance. The headline for Evan Horowitz’s piece in the Boston Globe (8/19/15) claims “Donald Trump Blazes a European Path in American Politics,” and Horowitz asks, “Does Donald Trump represent the emergence of a new force in American politics, a right-populist movement that could reorganize the American” political spectrum? Missing is the fact that, from President Andrew Jackson in the early 1800s through George Wallace in the 1970s to Pat Buchanan, there have been right-wing populist movements in the United States. It is not a European import. The key features of the populist radical right ideology – nativism, authoritarianism, and populism – are not unrelated to mainstream ideologies and mass attitudes. In fact, they are best seen as a radicalization of mainstream values. For many scholars, right-wing populism is classified as part of the “radical right,” while the term “extreme right” is reserved for insurgent groups seeking to overturn the constitutional order. In his book Populist Radical Right Parties in Europe, Mudde lists as common “extreme right” features nationalism, racism, xenophobia, anti-democracy and the strong state, including a law-and-order approach. The terms neo-Nazism and to a lesser extent neo-fascism are now used exclusively for parties and groups that explicitly state a desire to restore the Third Reich (in the case of neo-fascism the Italian Social Republic) or quote historical National Socialism (fascism) as their ideological influence. That’s not Trump. His ideology and rhetoric are much more comparable to the European populist radical right, akin to Jean-Marie Le Pen’s National Front, the Danish People’s Party or Vladimir Zhirinovsky’s Liberal Democratic Party of Russia. All of them use the common radical right rhetoric of nativism, authoritarianism and populism. There are a number of published articles linking Trump to Fascism. The Hartmann piece was reposted on Salon as “It can still happen here: Donald Trump, Ben Carson and the ‘American fascists’ among us; Sinclair Lewis feared demagoguery and a corporate ruling class. The right is bringing his dystopia to fruition.” Hartmann has been using outdated research on fascism since 2004, when he used the hoax Mussolini quote in a lengthy article. Hartmann returned to the subject again in 2009, still using outdated research but not mentioning Mussolini. . According to Lynch, this “definition may very well fit the GOP ideology: a kind of corporate fascism.” Alas, the quote is a hoax, widely circulated on the internet but debunked years ago. Mussolini never wrote or said anything like that, since the fake statement refutes Mussolini’s views on fascism. producing a nationwide crisis of agency, memory and thinking itself…a kind of ideological sandstorm in which reason gives way to emotion, and a willful limitation on critical thought spreads through the culture as part of a political project that both infantilizes and depoliticizes the general public. In the concluding chapter to The Origins of Totalitarianism, Hannah Arendt argues that totalitarianism must be understood as a new “form of government” in its own right, rather than as a transitory or haphazard series of external catastrophes afflicting classical forms like democracy or monarchy. Essentially different from the extralegal form of tyranny as well, totalitarianism’s emergence marks a terrifying new horizon for human political experience, one that will surely survive the passing of Hitler and Stalin. Arendt’s point is that the totalitarian form is still with us because the all too protean origins of totalitarianism are still with us: loneliness as the normal register of social life, the frenzied lawfulness of ideological certitude, mass poverty and mass homelessness, the routine use of terror as a political instrument, and the ever growing speeds and scales of media, economics, and warfare. As a nation, we enforced white Christian nationalism through the genocide of indigenous peoples and the enslavement and mass murder of black people for profit. For many decades, immigrants including those who were Irish, Italian, Polish or Russian were second-class citizens, not considered “white.” Women had few rights and were treated as the property of their fathers, then their husbands. Jews were perpetual outsiders. People with unpopular religious views were shunned and in some instances killed. Chinese were excluded, Japanese were interned in camps. Nativist racism periodically has cut a bloody gash through our body politic, without reliance on totalitarianism. Trump feeds the resentment felt by many people who are white, male, straight or Christian who feel displaced by “Others” taking over “their” nation. These people see themselves as the real producers of value in the United States, and consider the disparaged “Others” to be parasites. Thus the 2012 campaign of Republican presidential candidate Mitt Romney was built around the clandestine theme of mobilizing the “makers” against the “takers,” as reported by Eric Schulzke in the Deseret News (9/19/12). This is called “producerism” by scholars, and it is a central element of right-wing populism in the United States. While they usually overlap to some extent, they also can be seen as distinct, identifiable phenomenon. The lightning speed of the right’s rise can be explained by the simultaneous existence of all five factors. Further, in this period they not only overlap, but reinforce each other. This mutual reinforcement accounts for the exceptional force of the current rightward swing. Scholars Michael Omi and Howard Winant, in Racial Formation in the United States: From the 1960s to the 1990s, suggest that this set of circumstances makes many Americans fear the end of the “American Dream.” This backlash is picking up speed. The Republican voter base in the Tea Party long ago shifted its attention away from fiscal restraint toward anti-immigrant xenophobia, banning abortion and pushing gay people back into the closet. Many scholars of fascism and neofascism now suggest right-wing populism can metamorphosize into these fascistic totalitarian forms, but they recognize that it seldom does–and that fascist movements seldom gain state power. Yet the demonization and scapegoating that accompanies right-wing populism in the United States is breeding a counter-subversion panic targeting immigrants, Mexicans, Muslims, feminists, gay people, liberals and leftists. Planned Parenthood has become a special target to appeal to the Christian Right. The passage of federal Civil Rights Act in 1964 propelled many Democratic Party “Dixiecrats” into the Republican Party, where they now appear at campaign rallies in freebie “gimme hats” touting Monsanto, Koch brothers fertilizers and Coors beer. They choose racial privilege over economic security. That’s What’s the Matter With Kansas. Now this mass base cheers Trump on while he is Mobilizing Resentment–the title of Hardisty’s 1999 book about the rise of right-wing politics in the US. McVeigh argues that it is shifts in power dynamics and hierarchies in economic, political and social spheres that launch the processes in which radical right-wing groups attract members, and sometimes a mass base large enough to intrude into the larger society. Using as his analytical example the Klan in the 1920s, McVeigh demonstrates that the right-wing KKK in the 1920s was composed of white people attempting to defend their relatively more privileged position in the social, political and economic life of their communities (E-Extreme, 2-3/10). In covering the Charleston story, the New York Times (6/22/15) invented a cowardly phrase, “white primacy,” to describe the blatantly white supremacist group, the Council of Conservative Citizens, where Dylann Roof apparently learned this storyline. conform to some of the demands of a presidential race, making him, in some ways, more of a typical politician. It suggests that, as much as the Republican electorate is becoming more comfortable with the idea of Mr. Trump as its standard-bearer, he is embracing the rituals and expectations of the role, too. The Trump candidacy and the shooting in Charleston are connected thematically by a mobilization to defend white nationalism while the racial and ethnic face of America changes hue. The populist right and the extreme right fuel each other. This backlash is picking up speed. The Republican voter base in the Tea Party long ago shifted its attention away from fiscal restraint toward anti-immigrant xenophobia, banning abortion and pushing gay people back into the closet. The more we as a nation ignore this process of nativist demonization, the more targets will be painted on the backs of our neighbors. History will record how long these right-wing backlash movements will spread their virulent rhetorical venom in our nation. But as Arendt observed, history judges us as individuals as to whether or not we stood up and spoke out against the banality of evil.